Now works on Windows 7, 8 and 10! RIP Vinyl is designed to let your vinyl records rest. You can transfer a personal copy of your LP or cassettes to CD or your MP3 player, and listen to it over and over again, without the wear and tear on your vinyl--leaving that for special occasions. 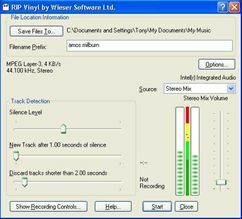 The software is also great for protecting spoken word tapes that children listen to over and over again, saving you the expense of buying a new copy when they wear out. And the best bit? RIP Vinyl is simple to use. How about picking favorite tracks off several albums to make a compilation CD for the car. Go on; let your vinyl Rest In Peace. You can also use RIP Vinyl to create your own Podcast. Just record from your microphone or mixing equipment, and start Podcasting today! Pay with a credit card or bank account using PayPal! We now accept PayPal for your convenience. PayPal allows you to pay direct from your bank account or with a credit card. You can even pay with a credit card if you don't have an account with PayPal. Other payment methods are listed further down the page. It is often cheapest and easiest to pay with PayPal. We are no longer VAT registered, so don't charge any VAT. However, some european countries do apply taxes on E services (VOES) so unfortunatley, reporting burdens prevent us from selling in those markets. Click the button on the left to Buy Now. When you purchase with this method, a download link will be displayed for you as soon as your payment clears, as well as being sent confirmation details to your email address.